While the big win of the German Pirate Party in Berlin was big news, reported even by the New York Times (see also “Boarding Berlin“), yesterday’s win in the state of Saarland had already been expected and thus received less international attention. However, the success is remarkable. With 7,4 percent of the votes, the Pirate Party will receive twice as many seats in Saarland’s state parliament than the Greens. Even more importantly, the Saarland results refute two common explanations of the Berlin victory. First, the success in Berlin was no one shot wonder. Second, Pirates can also win in more rural areas outside of city states . As a result, media commentators turned to another narrative, attributing the Pirate Party’s success mainly to collecting protest votes. I think this is wrong. While protest does play a role, several indicators suggest that this is not the dominant one. Strong membership base: Fueled by local election successes, the German Pirate Party reports growing membership numbers all over the country (see Figure below). However, becoming a member can be interpreted as a sign of identification with an organization and differs from mere protest that is directed against the so-called “established parties”. 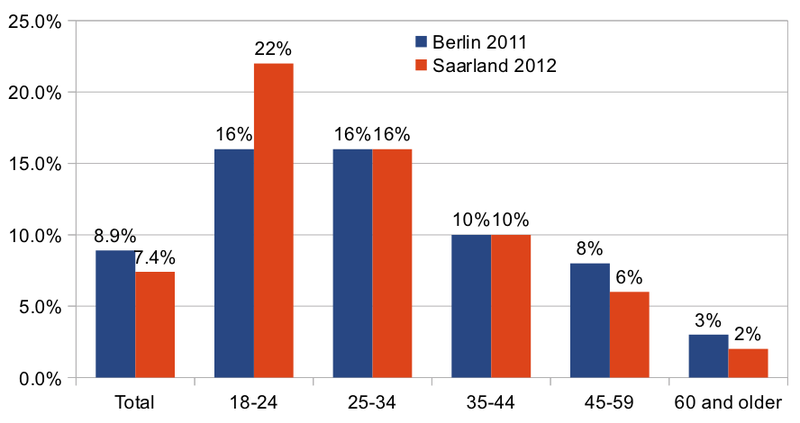 Success among young voters: Similar to Berlin, nearly one quarter of the first time voters (23%) gave their vote to the Pirate party. The sharp generational divide (see Figure below) indicates that other reasons than protest are more important for the Pirate Party’s success. At least, the Internet generation or digital native arguments seem more convincing than the protest argument. Transnational dimension: As mentioned several times on this blog (see, for example, “Pirate Party Win in Berlin: Transnational Implications?“), the German Pirate Party can only be understood in the context of several transnational movements. Together with Kirsten Gollatz, I have written a book chapter on the transnational dimension of the Pirate Party’s success, which will appear soon in the German volume “Unter Piraten” edited by fellow research blogger Christoph Bieber and Claus Leggewie. We will present some of the data we collected for this chapter in a series on this blog soon. A little annotation to the membership graph: I don’t think this numbers are very reliable. 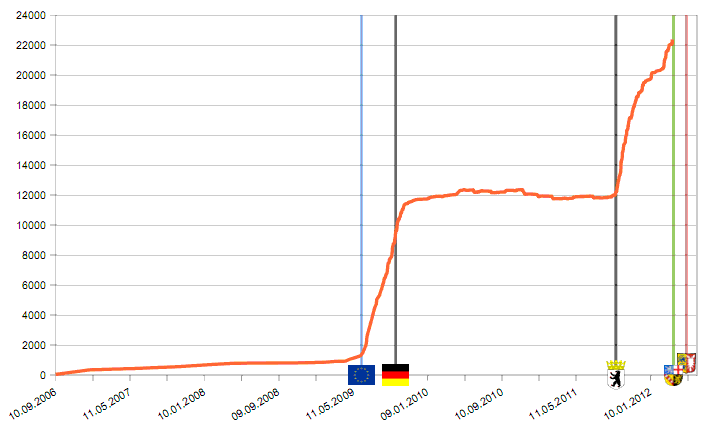 In Bavaria the pirate-wiki says 4.700 members, but at the party convention there were only 1.700 members entitled to vote. The rumor goes, that everybody on a mailinglist may be counted as “member”. Beautification of member-numbers is an old tradition in political communication, so many people are looking forward to reliable numbers, while the pirates grow more important. Thank you for the clarification and of course you are right that the absolute numbers are not very accurate. But for the argument that the pirate party can rely on a growing base of supporters who identify with the movement it is not so important whether all these so-called members are also paying their membership fee. The main point is that lots of people are engaged for the pirates – and not just against the established parties..
Hey leonidobusch- I’m a 4th year undergraduate student at UCLA doing my thesis on the Pirate Parties. I am currently struggling to get a theoretical grasp on what’s going on here. Do you have any conceptual theories you may be able to point me to that would help? Any help would be so appreciated! Hello all- I’m a Globalization Studies major at UCLA doing my thesis on the Pirate Parties. I’m really struggling with a conceptual theory to describe what’s going on with the parties and also their relation to something like Creative Commons. Do you have any ideas that might be helpful? I would be so so so so thankful. of course, there are many different theoretical perspectives on the Pirate Parties’ success. One stream of literature I found particularly helpful is the one on mobilization and counter-mobilization. Together with my colleague Sigrid Quack we have a paper forthcoming in Review of International Political Economy, an earlier working paper version of it can be found here. Oh my goodness. I just realized I posed twice- how silly and I can’t even delete it. That is to say these organizations share a vision to create an ‘information commons’ but they do so from distinct angles (perhaps even ethical articulations of liberalism) ? I just sent you the an updated version of the paper via mail. With regard to your questions: I would say both CC and PPs are ideologically diverse and do not embrace one coherent articulation of liberalism. What they do share is fundamental criticism of how the copyright system works and, ironically, a reformist stance. In other words: even the pirates are hesitant to completely legalize all forms of piracy.